A convicted killer’s clue to the I-Team has prompted law enforcement to renew a search in Suffolk County for the body of a long missing Long Island woman whose head was found in the Florida Everglades more than a decade ago. Sarah Wallace reports. A convicted killer’s clue to the I-Team has prompted law enforcement to renew a search in Suffolk County for the body of a long missing Long Island woman whose head was found in the Florida Everglades more than a decade ago. It’s the latest twist in what has become an almost surreal and gruesome murder mystery. Lori Hatzakorzian disappeared near her Long Island home in 2007. Her head was discovered in the Everglades shortly thereafter, but the rest of her remains were never found. A man named Paul Trucchio and a friend of his who knew the woman in New York were later charged and convicted in Florida. There was no evidence anywhere else -- until, maybe, now. Trucchio, currently serving time in a Florida prison for Hatzakorzian's murder, contacted the I-Team through his attorney. He would end up sharing a map that he said would lead investigators to Hatzakorzian's remains in New York. A killer's clue to the I-Team has now lead to a search in Suffolk County for the body of a missing Long Island woman. Sarah Wallace reports. 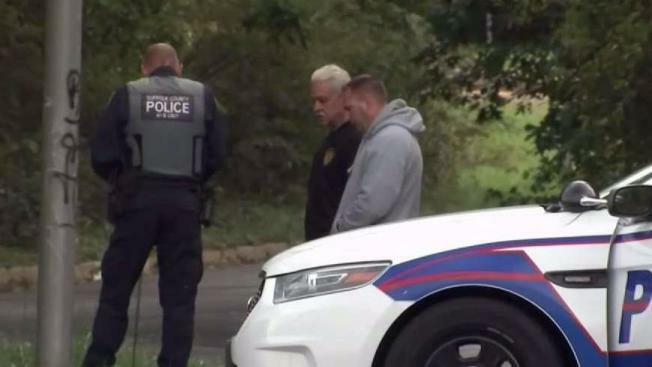 "I'm telling you, the remains, the body of the victim is at that location in Oakdale, New York," Trucchio said by phone. "It's located within that small wooded area." Trucchio put arrows on a map of the area and authorized the release of his information to law enforcement. On Tuesday, law enforcement teams began combing through the brush just off a service road in Oakdale where Trucchio indicated the remains of Hatzakorzian, who died when she was 41, were left. Cadaver dogs were also scouring the scene. Nothing had been found by early afternoon, but searchers remained determined. InvestigativeWhat Happened to All the Drinking Fountains in Newark? Trucchio, who pleaded no contest to murder but told the I-Team he is innocent, said he is coming forward now to give closure to Hatzakorzian's family. He says he also believes that if her body is found, he can argue legally that his conviction in Florida be thrown out and the case moved to New York for a new trial. He wouldn't say how he claims he knows where Hatzakorzian's body is allegedly located, but said it was the correct spot. Florida's Broward County Sheriff Lt. Scott Champagne, the longtime lead detective on the case and the current violent crimes section commander in his county, remembers how the story unfolded from the beginning. Last week, he took the I-Team back to the scene in the Everglades where he responded after getting a call he says he'll never forget. "It was floating on the water, yeah," Champagne said. Nearby, there was a grocery bag that would turn out to be a key lead; it came from Waldbaums, a now defunct grocery chain in New York. Now, Trucchio's map may connect some of the dots. "It’s in Long Island, it’s in New York," Champagne said of the body location tip. "It’s something to take a look at because we knew that there were ties to New York and that’s ultimately where she went missing." Champagne, who has followed several false leads from Trucchio, arrived on Long Island Monday to begin surveying the location in Oakdale. He had already flagged Hatzakorzian’s family about the possible development in the case. "They’re monsters," Cheryl Rowehl, Hatzakorzian’s niece, said of Trucchio and the other man convicted in the case. "They’re monsters. I don’t know how else to describe them." Rowehl said discovering Hatzakorzian’s remains would bring closure to the family after all this time. "Just to be able to bring her back and to be able to bury her as a whole and know that these two are never going to be able to walk in the real world again," Rowehl said." As for Trucchio being motivated to share the information because it might help get the Florida case dropped, Rowehl had strong words. "He always thinks he's going to beat everything but he's the one sitting in jail," she said.